Are you looking for superb quality Embroidery Digitizing Services and Vector Conversion of your logos at lowest prices? You are at the right place! We offer Digitizing services at $ 1.5 per 1000 stitches and raster Conversion services starts at $8 per artwork. We provide embroidery digitizing services to garment manufacturers, promotional companies, embroiderers and even digitizing firms themselves. Similarly Vector Conversion services can be used by Screen Printing Industry and Promotional Companies etc. We have the lowest prices as compared to any of our competitors. We do not compromise on quality and turnaround time. We offer a 24 hour turnaround time for custom orders with excellent quality. The prices on the web start at $1.75 and go up to $10.00 per thousand stitches. Our price is the best i.e. only $1.5 per thousand stitches. The raster conversion service prices on the web starts at $10 and go up to 200$ / artwork where as our prices start at $8 per artwork. Compare our prices with other companies on the web and you will find out that we are really the lowest price service provider on the web. So don't wait. Give us a no-risk try. Just order and get your designs digitized. Try our quick digitizing services to determine whether you would like to do business with us. We offer exclusive designs and accurate breed specific dog embroidery designs at only $2 per design. Browse through our huge selection of quality embroidery patterns and designs! We provide you with safe and secure payment options to buy from our collection. 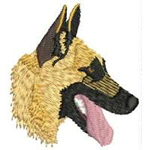 We offer a large number of designs, especially dog embroidery designs for machine embroidery that are digitized by the best artists in the industry. Embroidery Designs you purchase are sent to you through e-mail. Read more in our embroidery designs section. 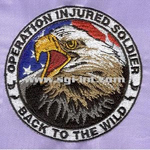 We are in the embroidery digitizing industry for more than 10 years. Providing low cost without any compromise on quality and turnaround time is a main challenge for any digitizing firm. However, with our dedicated hard work and time management, we have proved that we can be your best choice. You can view the quality of our work on the samples page or request us for sample work via mail. Have a look at our testimonials page and see what some of our customers say about our digitizing services. If you don't see the quality we don't see the money. If you lose, we lose ... it's that simple. We are doing raster to Vector Conversion and illustration for more than 8 years. At Stitch Graphic Interchange we pride ourselves on providing our clients with high quality conversions service. Our designers are formally educated and trained in graphic design & fine arts and are brilliant and extremely creative. With a 24 hour turnaround time for vector conversion, lowest prices and excellent quality, you cannot find a better deal than this..If you need to see the sample of our work, request us via email for the same. Also have a look at our testimonials page and see what some of our customers say about our services.